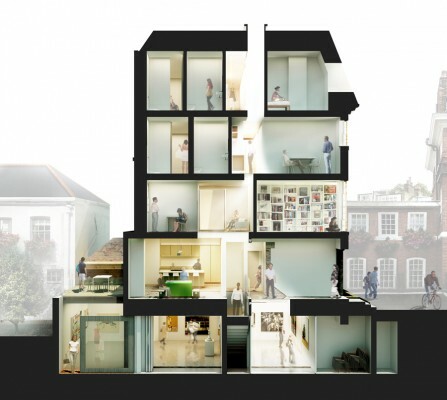 The project’s architects are Chris Romer-Lee and James Lowe, directors of London-based architects office (‘Small Project – Architect of the Year’ finalist, Architect of the Year Awards 2013) with Shahira Fahmy. Bradfield College is an independent school situated in the Berkshire countryside. At the heart of the school, is a 1000 seat amphitheatre. Enclosed by mature trees and planting, the setting is romantic and magical. Since 1890, the school stages a triennial Greek play that is world renowned. This English architecture practice have been granted planning permission for a single storey extension in south east London. The extension’s appearance and detailing is a direct response to the well preserved 1930s architecture of the property. The 1930s were a rampant period of homebuilding, strong orthogonal forms with repetitive and economic structural rhythms dominated the architecture and furnishings. This London architects office were in Spain for The Madrid Symposium. Following Studio octopi partner James Lowe’s win as one of this year’s ‘40 under 40’ leading European architects, an exhibition of our projects was unveiled at the symposium. James’ duties also extended to a short talk on our Stratford Kiosks Competition win.